The Patton Model OS1052 delivers flexible and modular multiservice solutions for 2G/3G backhaul, fixed-line networks, and private and utility networks. 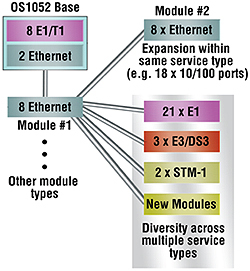 The Patton OnSite Series Model OS1052 is an ultra-compact next-generation flex access node. The OS1052 is the platform of choice for economical deployment of access points with low initial count of E1 and Ethernet ports, but with flexibility for future capacity expansion and simple migration toward converged IP service networks. The OS1052 supports 3G/4G mobile network backhaul, secure and scalable carrier Ethernet transport, multi-service aggregation, quad-play connectivity (voice, data, video and mobility), and technology mediation among TDM, ATM, and Ethernet. The advanced modular design of the OnSite OS1052 provides unequaled flexibility in its class in terms of service offerings, capacity and functional upgrades. The OS1052 incorporates next-generation SDH features such as virtual concatenation (VCAT), link capacity adjustment scheme (LCAS) and generic framing procedure (GFP) for efficient packet data transport. The platform also incorporates Layer 2 features such as VLAN tagging, rate limiting and statistical multiplexing with multi-level QoS control. 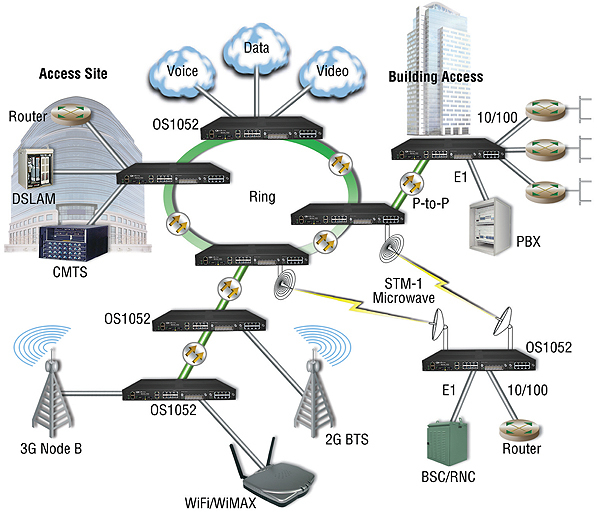 The base OS1052 system is configured with 2 STM-1, 8 E1/T1 and 2 Ethernet 10/100Base-TX. The advanced modular design of the Patton OnSite OS1052 provides unequaled flexibility in its class in terms of service offerings, capacity and functional upgrades. The OS1052 incorporates next-generation SDH features such as virtual concatenation (VCAT), link capacity adjustment scheme (LCAS) and generic framing procedure (GFP) for efficient packet data transport. The platform also incorporates Layer 2 features such as VLAN tagging, rate limiting and statistical multiplexing with multi-level QoS control. The OS1052 is easily configured and managed through a simple Web-based GUI interface or the scalable Patton OnSight NMS.